An international human rights group says child soldiers as young as 13 are serving in the army of the Democratic Republic of Congo. Human Rights Watch is urging the Congolese government to release the estimated 300 to 500 youngsters, whom they inherited when they absorbed the armies of former rebel warlords under terms of a peace plan. The Congolese situation is not unique. The United Nations estimates that 300,000 children serve as indentured soldiers in rebel and government armies around the world. VOA's David McAlary reports from Washington that if the youngsters survive their ordeal, they are usually left with severe psychological wounds. Human Rights Watch says the average child soldier is aged 13-17, but some have been as young as eight or nine. Most are unwilling militants, abducted from their villages to serve as soldiers, guerrilla fighters, or supporting roles in armed conflicts in more than 50 countries. They wield weapons in battle, serve as human mine detectors, participate in suicide missions, and act as spies, messengers, or lookouts. "Children by the thousands have been literally kidnapped from their homes and their communities, and subjected to the most horrific forms of violence," said the children's rights advocate for Human Rights Watch, Jo Becker. She says children typically make obedient soldiers because they are vulnerable and easily intimidated. "They are forced to commit atrocities against members of their own community, sometimes members of their own family," she said. "The girls are often used as wives by the commanders and subjected to what is essentially sexual slavery." "They are terrorized into compliance by being threatened with death, if they try to run away, and even being forced to kill other children who try to escape," she added. Studies show that these youths are left with severe psychological scars. In Belgium, Ghent University researcher Ilse Derluyn and colleagues interviewed more than 300 former child soldiers who had been abducted by the northern Ugandan rebel movement, Lord's Resistance Army. Ninety seven percent suffered post-traumatic stress disorder after an average of two years in servitude. Derluyn says their problems were typical of this syndrome -- persistent nightmares and trouble sleeping and concentrating that lingered long after their ordeal ended. "These do not get better with time," said Derluyn. "Even the children who returned a long time ago from their abduction still suffer from post-traumatic stress reaction." The researchers found that children suffered less stress if their parents were still alive, especially their mother. Derluyn says reuniting them with their families and previous social networks would help restore their psychological health. But many of the children are not so fortunate. "A lot of children do not have parents anymore, or one of the parents has died," she said. "Also, they committed a lot of atrocities against their own neighborhoods sometimes, so it is quite difficult to reintegrate them into the neighborhood and the living situation." 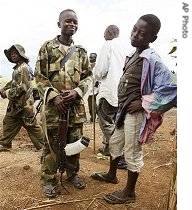 The international community has focused on the child soldier problem in recent years. The 2002 Convention on the Rights of the Child, the International Labor Organization, and the African Charter on Rights and Welfare of the Child ban the use of children as soldiers. The International Criminal Court defines child military recruitment as a war crime. The U.N. Security Council has condemned the practice and passed six resolutions against it since 1999. The most recent, in 2005, outlines a system of reporting and monitoring. The United Nations Children's Fund has worked with governments and private organizations to demobilize and rehabilitate thousands of children in Sierra Leone, southern Sudan, Afghanistan and other countries. But Jo Becker of Human Rights Watch says that the Security Council has applied sanctions only twice. Last year it imposed travel bans on and froze assets of recruiters in Democratic Republic of Congo and Ivory Coast. She says sanctions must be more common. "What we need are concrete actions that show that the legal framework is not just words on paper," said Ms. Becker. "We do need active prosecution by national courts, as well as ad hoc tribunals and the International Criminal Court. Another thing we need is strong action by the U.N. Security Council that will impose targeted measures against the parties that are responsible." Ms. Becker says individual nations should also impose their own sanctions against those who traffic in child soldiers.